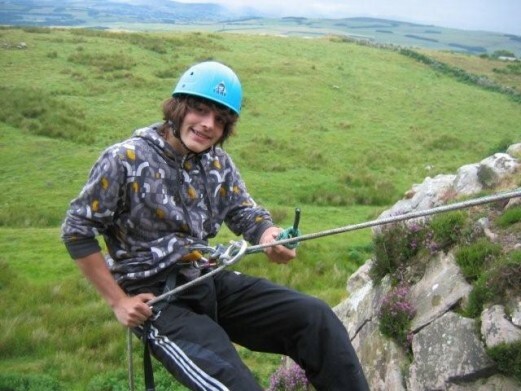 On a windy but bright Saturday morning 14 Senior Scouts from around Northumbria Area met at Bowden Doors Crags for a weekend of climbing led by 2 leaders with the SPA climbing instructors qualification and equipped by the Awards for All lottery fund. There were all skills and abilities represented but everybody had a great opportunity for multiple climbs and to improve. Over half the Seniors took on the challenge of learning to lead climb, placing their own safety gear in the rock and being responsible for protecting themselves from any slip or fall. On the Saturday night the group went for a slap up meal (the annual area Seniors Dinner) in full uniform experiencing fine dining and getting a taste for some of the better things in life and ended with a camp fire. Sunday was bright an breezy and allowed everybody to climb harder. The wind got up and by 3pm we were chased of the hill in a really heavy storm but in high spirits. We will all be back next year.